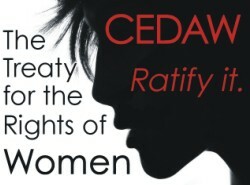 The Convention on the Elimination of All Forms of Discrimination against Women (CEDAW, 3 September 1981) is the most comprehensive treaty on women's human rights, establishing legally binding obligations to end discrimination. Often described as the international bill of rights for women, it provides for equality between women and men in the enjoyment of civil, political, economic, social and cultural rights. Cambodia has become the 100th country to ratify a key international treaty that allows women who have been denied their rights in their own countries to have their claims reviewed directly by a UN committee of independent experts: the Optional Protocol to the Convention on the Elimination of All Forms of Discrimination against Women. “Rights, also women's rights, without legal tools to make them a reality, can easily become mere illusions,” said Cees Flinterman, Chairperson of the Working Group on communications under the Optional Protocol. “Therefore it is so important that States parties to the Convention provide for remedies, not only at the domestic level, but also at the international level. Any person or groups from States which have ratified the Convention and its Optional Protocol can submit a complaint to the Committee. Communications may also be submitted on behalf of other people or groups with their written consent. Discrimination is to be eliminated through legal, policy and programmatic measures and through temporary special measures to accelerate women's equality. The Optional Protocol (OP CEDAW, 22 December 2000) is a separate human rights treaty that complements the Convention, and must be independently ratified or acceded to by governments that are already parties to the Convention (186 States parties). Source: Office of the High Commissioner for Human Rights.